In the latest indication of the breadth of U.S. tax cheating and duplicity, the Internal Revenue Service reported Thursday a staggering $458 billion average annual difference between taxes that are owed and actually paid. The report showed that between fiscal 2008 and 2010 there was a nearly half-trillion-dollar a year difference between the overall $2.49 trillion federal tax liability and the amount that was paid voluntarily or in a timely fashion. The tax gap included an estimated $387 billion of underreported taxes, $32 billion of taxes never paid and $39 billion of underpayments of taxes due. The IRS says that roughly $52 billion of the $458 billion total eventually will be collected. The agency’s latest “tax gap” report, showing a roughly 2 percent growth since 2006, immediately touched off an uproar on Capitol Hill, with members of both parties complaining that IRS officials needed to do much more to increase compliance, at a time of renewed concerns about mounting budget deficits. While the lion’s share of losses were from unpaid individual taxpayers, many corporations and businesses dodged their tax obligations as well. 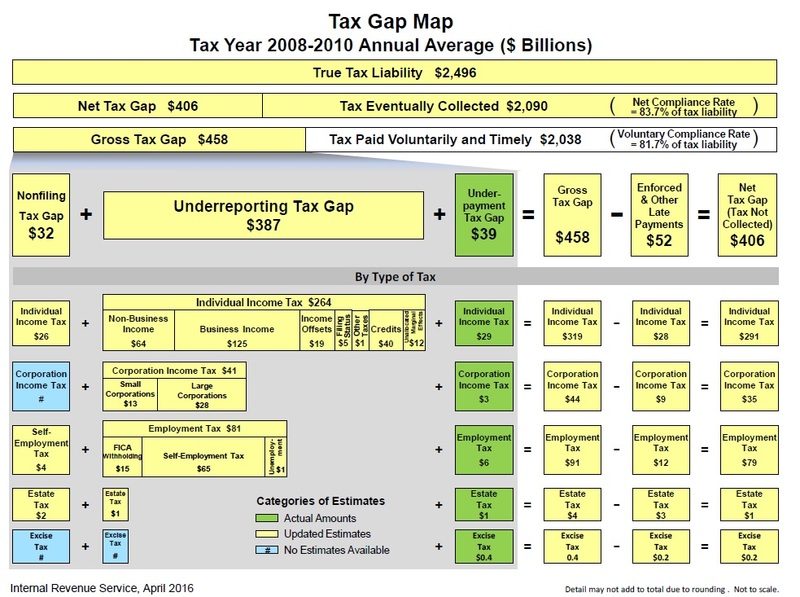 Wyden and others said that the hundreds of billions in uncollected taxes could be put to good use shoring up government programs including Medicare, according to The New York Times, and that it was long past time for the IRS to put in place better tracking and auditing systems to substantially close the huge gap in tax collection. But in criticizing the IRS for falling down on its rate of collections, lawmakers in both parties were engaging in blatant hypocrisy. Congress over the past five years has sharply cut the agency’s budget in retaliation for some of its past practices, including the highly controversial targeting of mostly conservative political action organizations that were seeking tax- exempt status. Some of the deepest cuts were made in the area of tax code enforcement, meaning that there were fewer investigators and lawyers assigned to ferreting out tax cheats and scofflaws. According to an analysis by the Center on Budget and Policy Priorities (CBPP), the IRS budget has been cut by 17 percent since 2010, after adjusting for inflation. Some of the deepest budget cuts made by the IRS were in the areas of tax code enforcement, meaning that there were fewer investigators and lawyers assigned to ferreting out tax cheats and scofflaws, training of employees and upgrading outmoded information technology systems. There are now nearly 12,000 fewer enforcement employees, a 23 percent decline from the nearly 50,000 previously employed in that area. The gutting of the enforcement team couldn’t help but seriously cut into the agency’s tax collection rate. The Treasury Department has estimated that every additional $1 invested in IRS tax enforcement beyond the current level would yield $4 of increased revenues. “These steps . . . have weakened the IRS’s ability to enforce the nation’s tax laws and serve taxpayers efficiently, as the national Taxpayer Advocate, the Treasury Inspector General for Tax Administration, the IRS Oversight Board, and the Government Accountability Office have all documented,” the CBPP report stated. Under attack, Republican lawmakers agreed to a small increase in IRS funding for fiscal 2006, and a year-end omnibus bill last December provided an additional $290 million to improve taxpayer services and strengthening cybersecurity. The IRS’s overall net compliance rate fell from 85.5 percent in fiscal 2006 to 83.5 percent between 2008 and 2010, according to the new report, although much of that was attributed to the IRS employing more precise estimates of the extent of tax cheating. In analyzing the biggest factor in the tax gap – the $387 billion of underreported tax obligations every year – the IRS found that individual taxpayers were responsible for 58 percent of the losses. By comparison, businesses and corporations were responsible for 27 percent of the losses while “non-business income” from pass-throughs and other entities accounted for 14 percent of the tax underreporting.